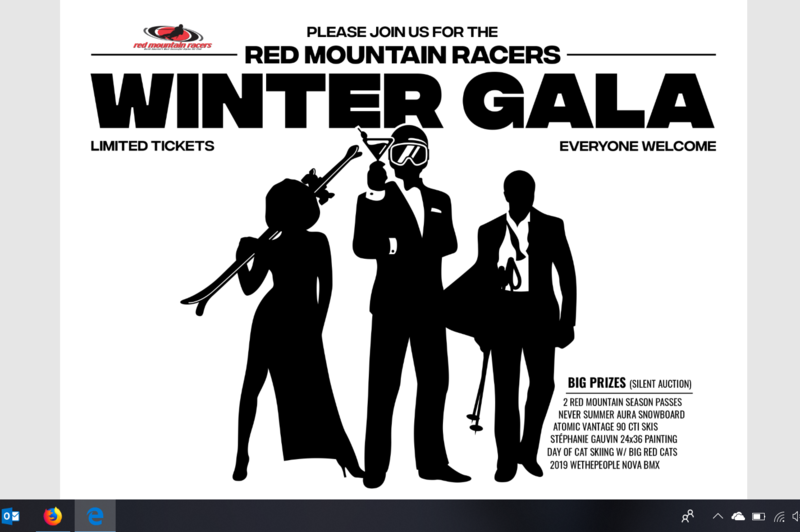 Supporters of Red Mountain Racers are swapping their skis and goggles for heels and martinis - shaken not stirred - and are asking the community to join them for a 007-themed evening of mingling, dancing, and a silent auction. The Red Mountain Racers Winter Gala is set for March 30th from 7:00 p.m. until midnight., featuring a canapé dinner at The Josie Hotel at Red Mountain Resort. Folks are encouraged to get their tickets fast; with only 120 tickets up for grabs, the fundraising event supporting the not-for-profit organization is expected to sell out. “This is a community event and your chance to put on your favourite tuxedo, whether that’s a Salmo dinner jacket or Armani suit,” laughs Linda Schulze, president of the Red Mountain Racers. The resurrected event is coming back bigger and badder than before with entertainment from DJ Inncouragable - a veteran of notable events like Shambhala and Burning Man - door prizes, and a silent auction packed with incredible items generously donated by local businesses. Top prizes include a Never Summer Aura Snowboard, Atomic Vantage 90 CTI Skis, a 2019 Wethepeople Nova BMX, a cat ski, a bike ride with Mike Hopkins, a shred experience with Dane Tudor, and so much more. Parents of ski racers volunteer their time and expertise to raise the funds necessary to keep costs down. It’s rare that this group of volunteers, passionate about skiing and giving their children the opportunity to take advantage of the mountain lifestyle, get to connect off the mountain or away from their volunteer posts. Schulze has two children in ski racing and began volunteering over 10 years ago, holding many positions before eventually taking the reins as board president. She has seen many talented athletes make their way up the ranks, including kids in the Nancy Greene Ski League who progress from being scared to run the gates to being the best in the province at U14. Red Mountain Racers is a learn-to-race program that climbs all the way up to provincial, national, and international level competition. Over the years, Red has produced high-calibre racers, free skiers, and, more recently, ski cross athletes, sending many racers on to the B.C. and Canadian alpine ski teams and NCAA college scholarships. “Lots of the best freeskiers in the world have a racing background,” adds Schulze. “I mean, look at Dane Tudor, Mike Hopkins, and Leah Evans - they all come from ski racing.” But it’s not just about turning out talented athletes; the program revels in raising kids who love the mountains and carry a gusto for playing outside and shredding pow well into their adult years. Beyond supporting a great cause, why not treat yourself to a night out? Schulze is already perfecting her Bond one-liners for an evening with great friends in the newly-opened boutique hotel. Tickets ($90) can be purchased at Butch Boutry Ski Shop or The Josie Hotel in a way reminiscent of the secret agent lifestyle. Just drop your payment and contact information in an envelope at either establishment and an electronic ticket - and your further instructions - will follow in an email. “This is an awesome opportunity to see the Josie,” adds Schulze. “I mean, I don't know if you’ve been up there, but it's quite a cool place - and it’s 007!” Why should James Bond have all the action, fun, and fancy resort living? Get in on it Saturday, March 30th - where tomorrow never dies.